Duvall's Amusement Rentals: Party Inflatables, Bounce Houses, Water Slides, and More! Hold a celebration or birthday party that attendees will talk about for years to come! Let Duvall's Amusement Rentals of Shreveport, Louisiana provide for all of your party needs and party rentals. 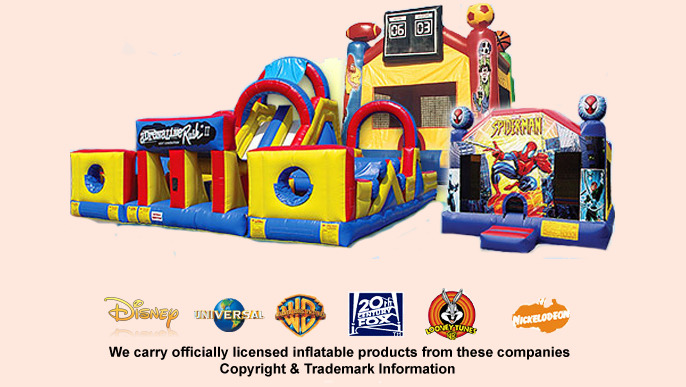 We supply Party Inflatables, Bounce Houses, Carnival Games, Water Slides and other Party Rentals. Check out our products page for a full list of party rentals, inflatables and much more. or give us a call! Why Choose Duvall's Amusement Rentals For Your Next Birthday Party or Celebration? We have been around for a while, we know how to throw a birthday party! Duvall's Amusement Rentals has been delivering quality service in the Shreveport and Boosier City area since 1982. We take our many years of experience in the industry and apply it to your needs to provide the best in Party Rentals, Birthday Party Packages and Carnival Games. We take the hassle out of Celebration Preparation! Do you dread the hard work and preparation that goes into planning a celebration or birthday party? Let us do all the grunt work. We include delivery, set-up, and tear-down for all of our Bounce Houses, Combo Bouncers, Water Slides, inflatables, and any Party Rental. Take the anxiety out of party planning and actually enjoy your party! We are located in Shreveport and Boosier City area for your convenience. If you are looking for Orlando Party Rentals you should look into No Limit Event Rentals; they provide bounce houses, water slides, and all types of party inflatables imaginable.